Saving sites without using "LiveBinder It"
For PC users, LiveBinders is compatible with Firefox 40 and higher, Safari 4.0.5 and higher, Chrome 30 and higher, and I.E. 9.0 and higher. For Mac users, LiveBinders is compatible with Safari 6.0.0, Chrome 30 and higher, and Firefox 21 and higher. For Chromebook users, LiveBinders is compatible with Chromebooks 55.0.2883.103 (64-bit) and higher. We also have apps for the iPhone, iPad, and Android. While not a requirement, we suggest that you add the "LiveBinder It" bookmarklet to your browser, which lets you add web pages to a new or existing binder while you are browsing the web. Learn more about "LiveBinder It" here or go to the LiveBinder It page to add it to your browser page to. To change your email preferences or email address, just click on your username at the top of the page. You will see a form with your current address and preferences. 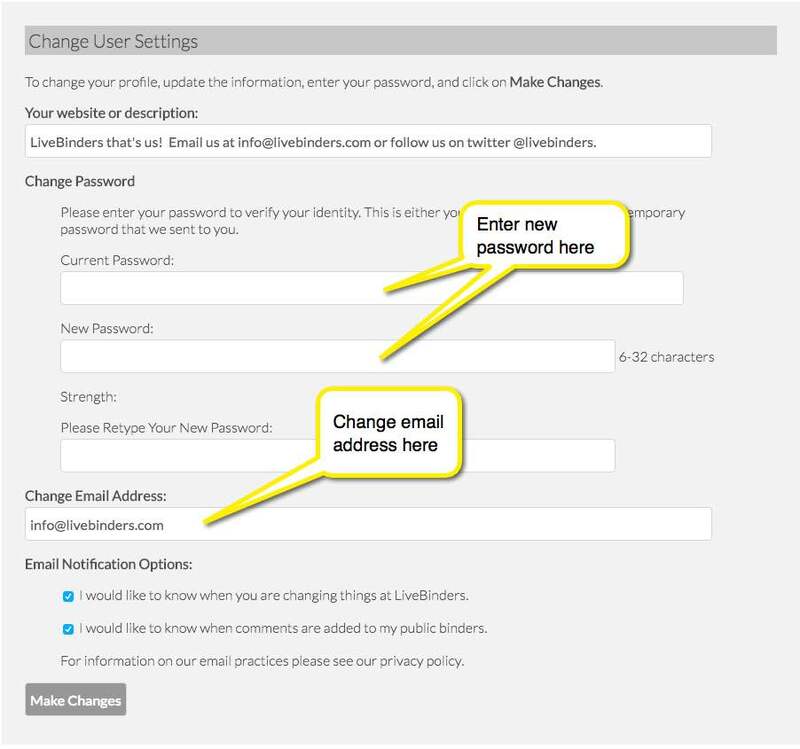 You can change any of the options shown, but you will need to enter your password again to make the change. Your description and picture can be added on your account information page. To access this page, click on your username in the upper right. You will see selections where you can type your description/blog address and upload your picture. 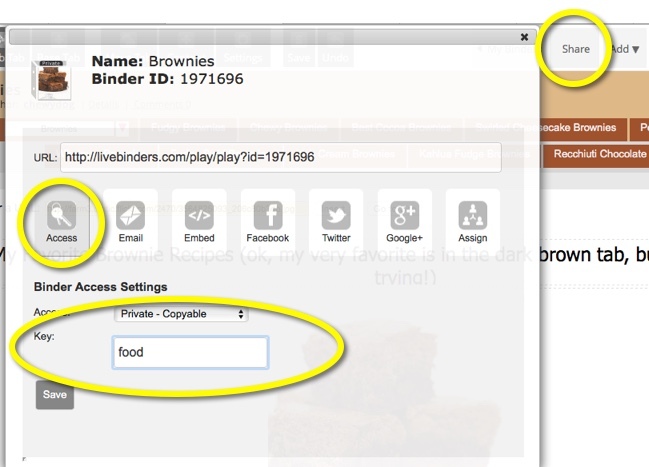 Students may sign up for LiveBinders using a teacher or parent's email. 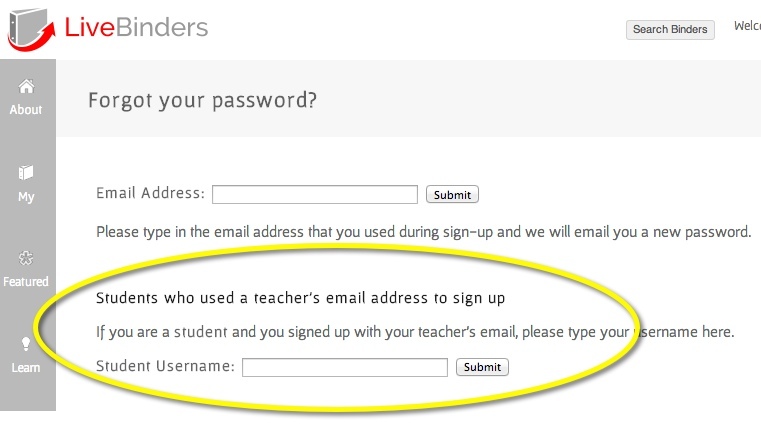 If the student forgets their password, an email will be sent to the teacher or parent's email address. 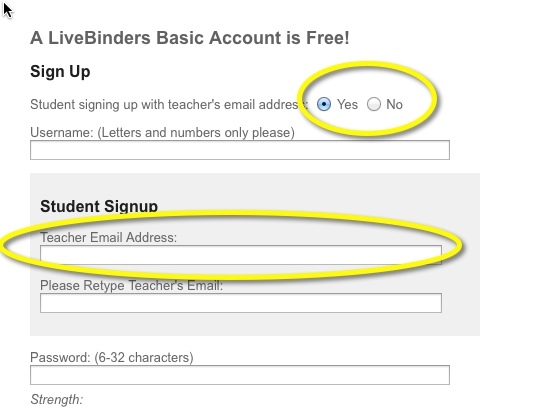 If you, as a teacher, already have a LiveBinders account, you may want to use a different email address for your student sign-ups. This is just in case the student enters your email address in the retrieve password box instead of their username. If your student forgets their password, they should enter their username in the student section of the retrieve password page. If your student will be collaborating with other students on a binder, the email they will need to use will be a combination of your email and the student username. For example, if your email is teacher@domain.com, than the student's email (for collaboration purposes) will be teacher+studentusername@domain.com. 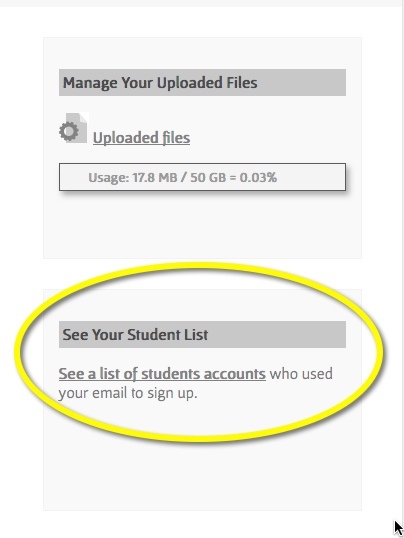 You can see a list of your student names by going to your profile page (click on your username in the upper right corner) and then clicking on See a list of student accounts. Just send an email to support@livebinders.com with your username in the email. If you are not using the email address that you signed up with, we will need a confirmation from your sign-up email address. Your account and all associated binders will be removed ASAP. Please feel free to share with us the reason for deleting your account. We deeply appreciate the feedback! Please fill out this form to change or cancel your LiveBinders subscription. 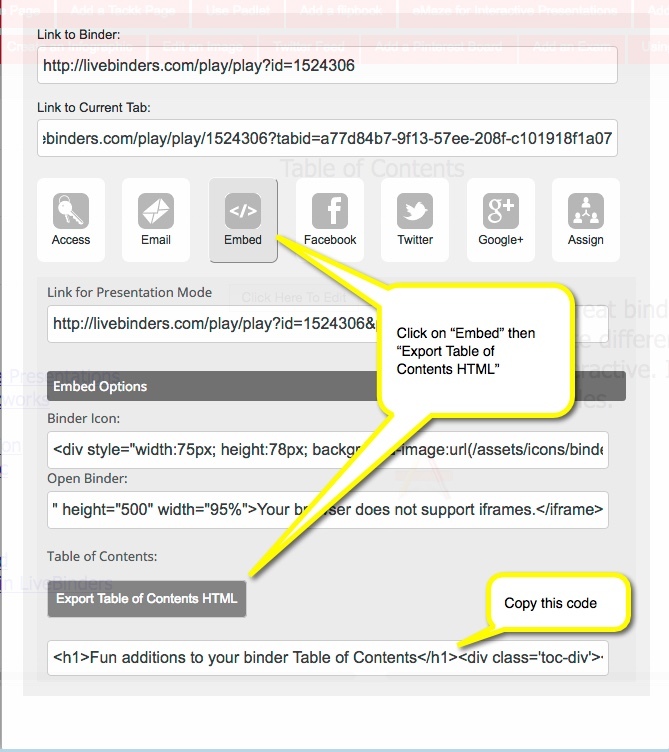 You can add web pages while you browse the web through our LiveBinder It feature. It is a bookmarklet tool that you add to your browser toolbar so you can add web pages that you find to a new or existing binder - without ever leaving the page. "LiveBinder It" is a bookmarking tool that you can add to your browser toolbar. 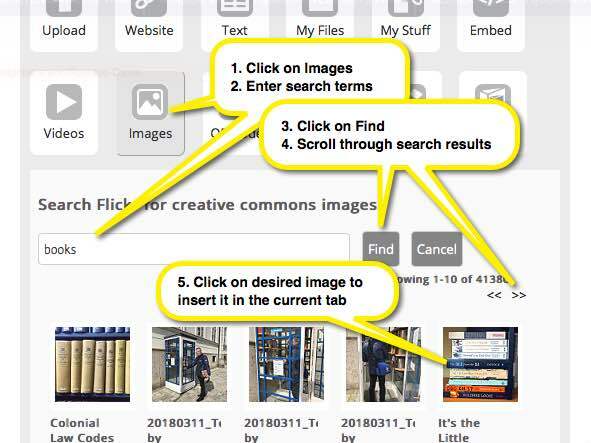 While you are browsing the web, you can add web pages directly into one of your binders or into a new binder in your account by clicking on the LiveBinder It link. 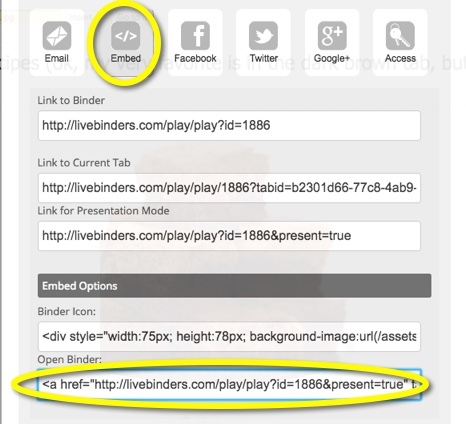 This way, you can add pages without having to go to the LiveBinders site. It is a quicker and easier way to add web pages to your binders. There are two ways to add "LiveBinder It" to the iPad. One is to add it on to Safari on your Mac and then sync your bookmarks with the iPad. Here is an explanation of how to sync your bookmarks from your Mac to your iPad. 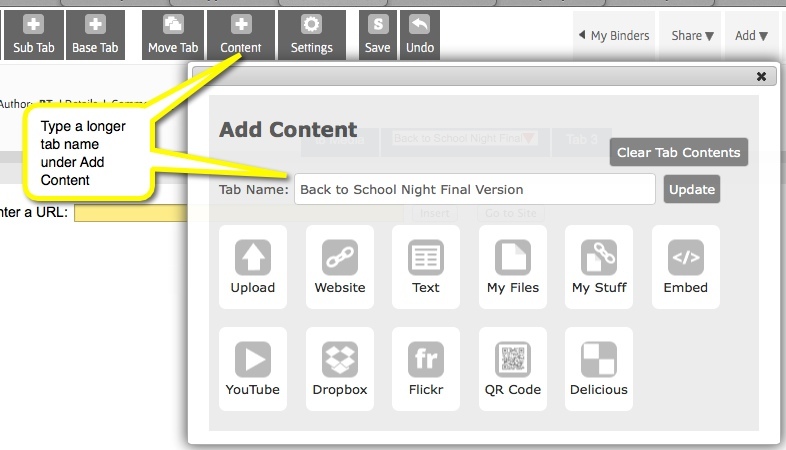 The second option isn't easy, but it will add the LiveBinder It feature to your iPad. Hopefully Apple will soon come out with a better way to add bookmarklets! Click on Done on the keyboard. 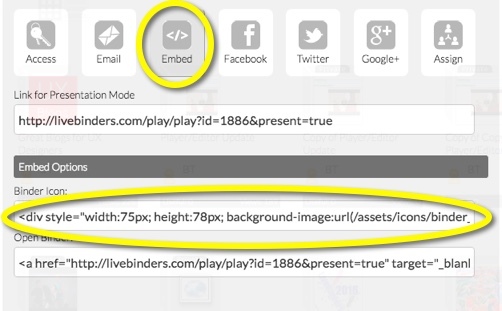 If you can't use the "LiveBinder It" bookmarklet because of your school's policy, there is another way to add links. Tabs organize content in a binder. A binder contains many web pages, or documents, where each web page/document is represented by a tab. For example, a binder with 20 tabs has a total of 20 web pages inside. You can add more than one page to a tab by adding sub tabs. If you have an upgraded account, you can add base tabs to your sub tabs for a third level of content. 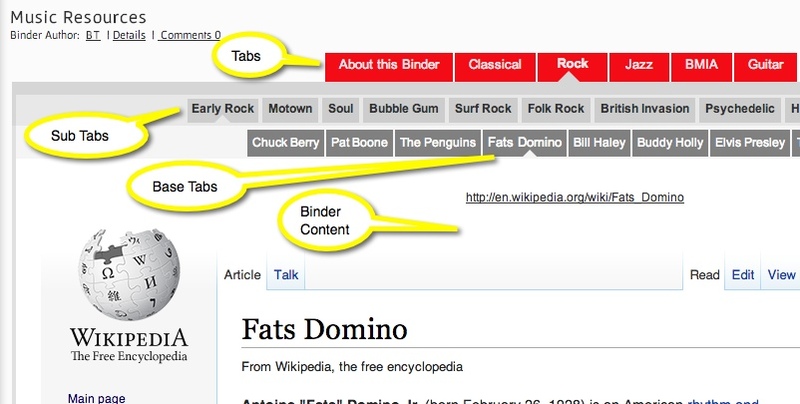 Sub tabs are just another layer of tabs in a binder and can be added to an existing tab. When you click on a sub tab you open another page. Sub tabs are located in the grey area underneath a selected tab, as you can see below. If you want to add more content to your sub tabs, you will need base tabs. 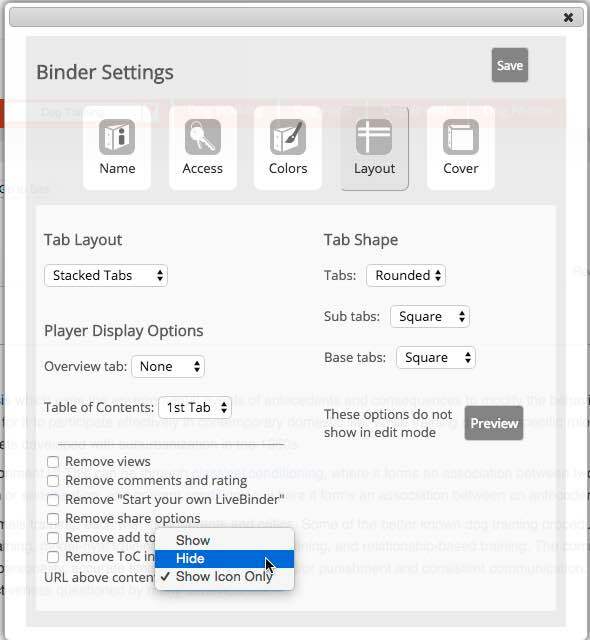 Base tabs add a third layer of tabs in a binder can and be added to any existing sub tab. When you click on a base tab you open another page. Base tabs are located in the grey area underneath a selected sub tab, as you can see below. Base tabs are only available to our subscribers. 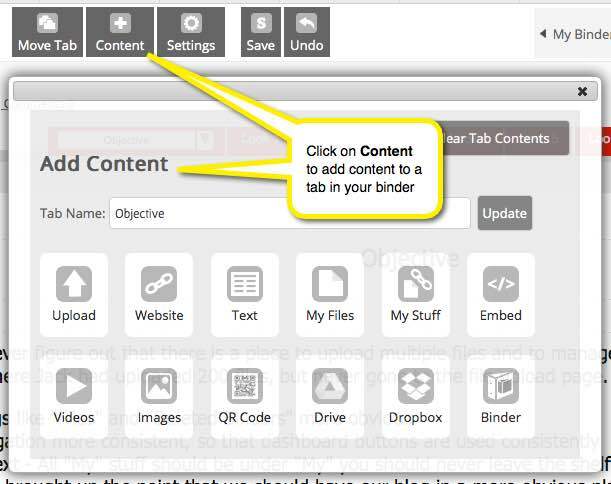 To add content to your binder, click on the Add Content button. 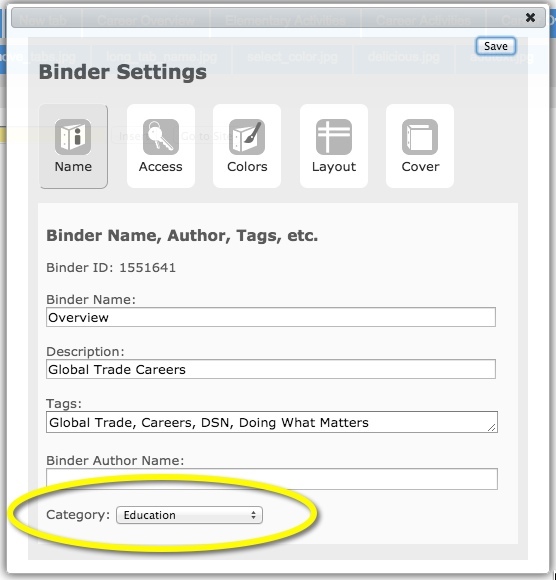 To change binder information such as its name, description, and default tab color, click on the Binder Settings button. Log in to your account. 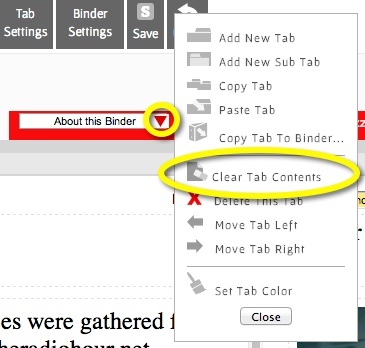 Select the binder you want to edit from the My page. Open the binder in Edit mode and double click the text area of the tab or sub tab you want to rename and type the desired name. To type a longer tab name, click on Add Content and type in the box there. Log in to your account and select the binder you want to edit from the My page. 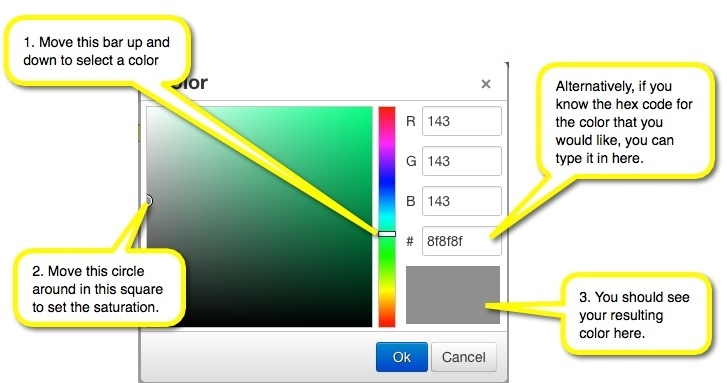 Select the tab that you want to color, then select the tab's pull-down menu by clicking on the red arrow next to the tab title. 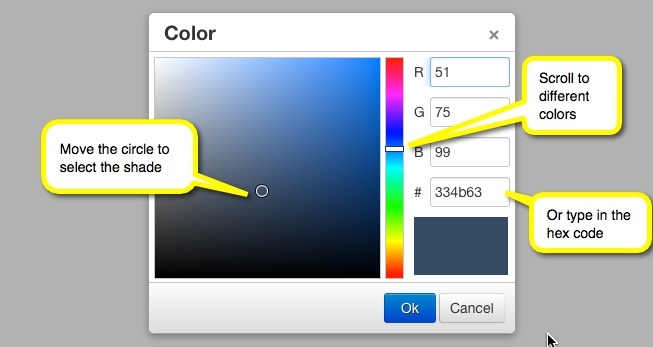 Select a color and click Apply. Note: You can change a sub tab color or a base tab color but you won't see the change until you move to another tab. Select the tab, sub tab, or base tab that you want to delete. Click on the red arrow next to the tab name. Select Delete from the pull-down menu and then confirm the deletion in the pop-up window. Results will display with the most recent first. To upload a single file, log in and open the desired binder in Edit mode. There is currently a 5MB file size limit on file uploads for the free version of the product. You can upgrade to upload larger files. Please note: Uploaded files are public in the free version of the product. Our subscription version offers private uploaded documents. You can upgrade to upload private files. To learn more about Document Security for your uploaded content, click here. Note: You can upload any type of file, but Microsoft Office documents will show up a links inside the binder because Microsoft applicatons do not run in the browser. 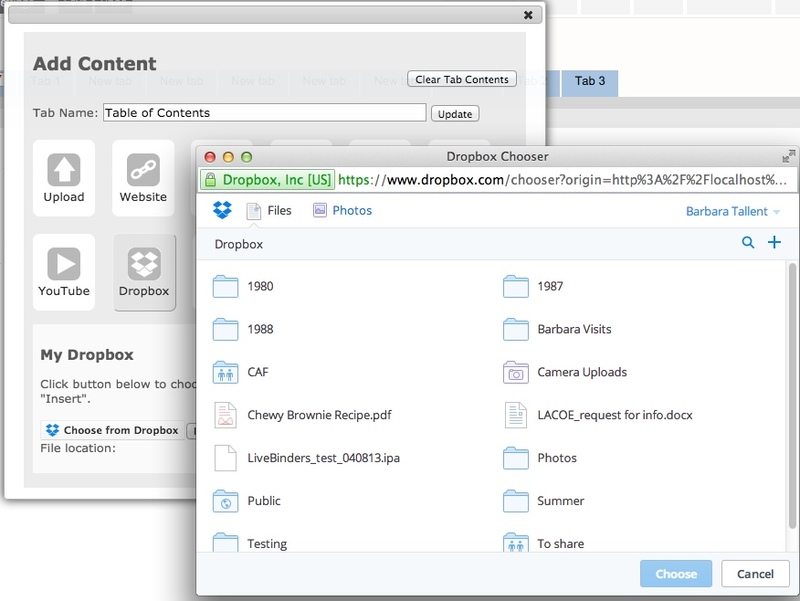 PDF files will show up inside the binder on all browsers. JPG files will also show up inside the binder on all browsers. If both the binder owner and the collaborator are subscribers, the collaborator can upload their file to the binder owner's account. This is the default for our subscibers. This box can be unchecked if uploading to the owner's account is not desired. Mouse over your username in the upper right corner and select My Uploaded Files. You will be taken to the file upload page. On this page you can manage your uploaded documents and upload multiple documents. 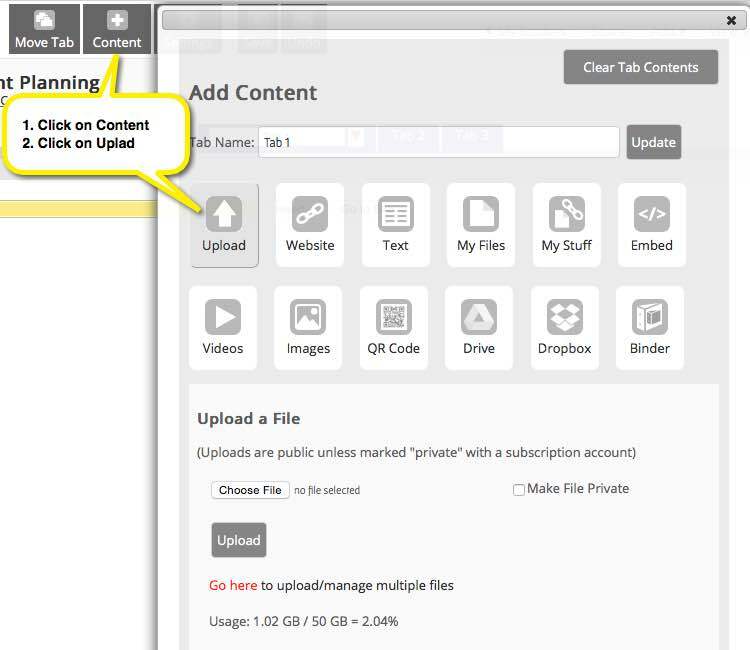 To upload multiple documents, click on the Upload Files link and then click on the Add Files button or drag your files into that box. 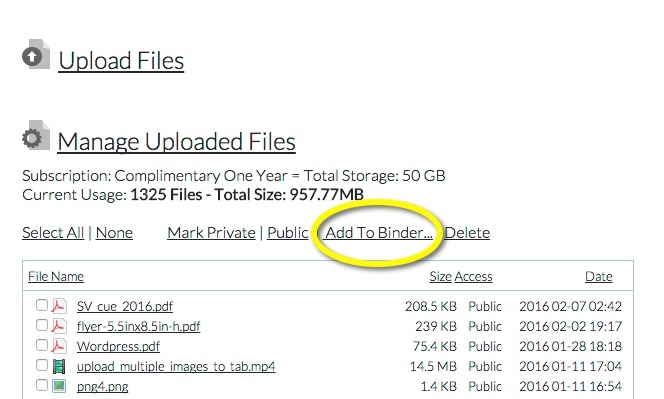 Once your upload is complete, you can add the files to your binder by checking them in the Manage Uploaded Files section, then clicking on Add To Binder... This will open an instance of "LiveBinder It" that will allow you to add those files to any of your binders. Insert the files from the file manager using "LiveBinder It"
Number one above works well if you are inserting the files in a new binder or if you want them to all be inserted at the end of the binder or tab. Here is how to use that feature. If you need a more interactive insert, than number two is your best option. It will let you go from tab, to sub tab, to base tab, inserting files where you need them. You can move from tab to tab leaving the menu open and inserting the files. Note: Do not insert private files as links. Private files must be opened inside the binder to maintain document security. Switch to a text-only template (one or two column text) on a tab or sub tab by clicking on Add Content then Text and selecting a layout that says "Text"
Each file will show up as a link. You can change the text on the link to make it more descriptive by clicking in front of the link and typing. Once you type the text, you can delete the remainder of the link. When you have a tab with subtabs it is sometimes nice to add an image to the tab so that it is not blank. We let you search the Flickr database for images that you are allowed to use. Go to the tab, in Edit mode, where you want the image. Log in to your account. Open the binder you'd like to change from the My page by clicking on the yellow edit button below the binder. Use a current tab for your binder cover. It needs to be either an uploaded .jpg, .png, or .gif image; or a Flickr/YouTube image inserted with our search tool under Add Content. Upload a .gif or .jpg image. The image does not have to be any particular size, but it works best when it is square. Use our search tool to find an image on Flickr, YouTube, Dropbox, or in content that you have already uploaded. Go into your binder in Edit mode. 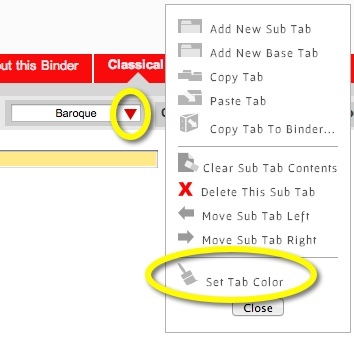 If you are planning to use a tab for the binder cover, go to that tab. Click on Settings at the top, then click on Cover. You will see a menu with the three options. If you want to use the current tab as a binder cover, just click on Use Current Tab. The content in the tab needs to be either an uploaded image or a Flickr or YouTube image imported through the Add Content menu. Click on Upload. Select a file from your local computer and click on Upload. You should see your binder cover change. You can also use an image from Flickr's creative commons library. Just click on Images and use a search term to search for an image. When you find one you like, just click on the image and it will be inserted as the binder cover. 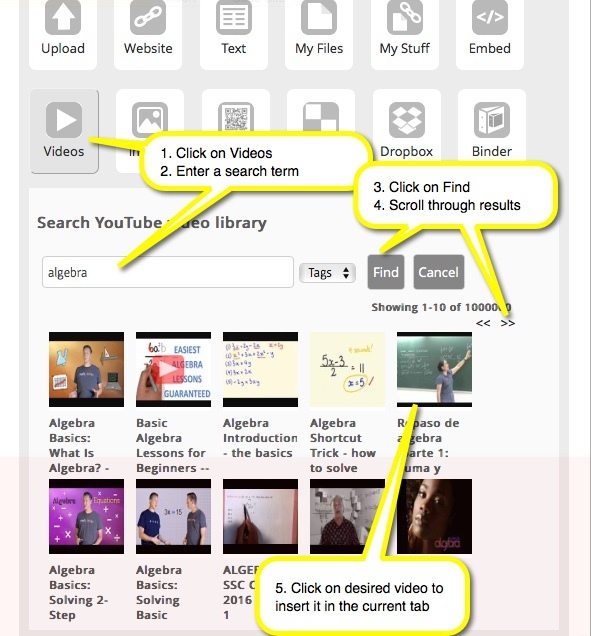 You can also do this with a YouTube search by clicking on Videos. 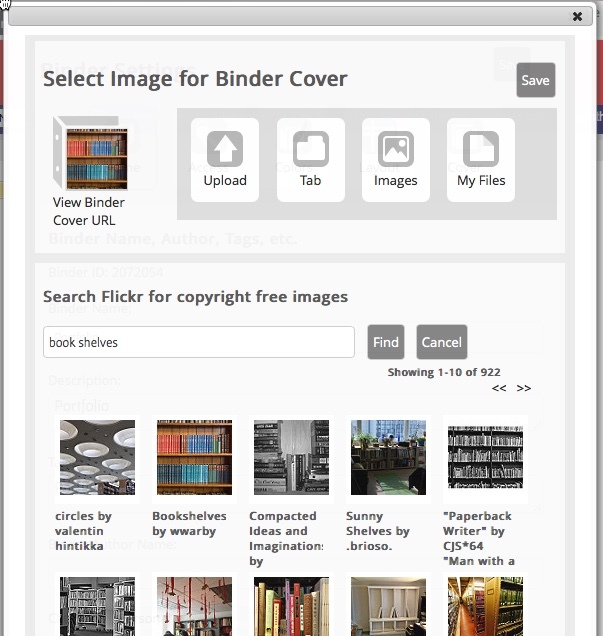 If you have an image from another binder that you would like to use, you can search for that image using My Files. Note: Dropbox recently changed their policy and pdf documents will now show up as downloads instead of embedded in the binder. If you want pdf documents embedded in the binder, you can upload them directly to LiveBinders or use Google Docs or Box.net. In a new tab, go to Facebook's plugin page. In the Facebook interface add your facebook URL and customize the widget, you will see a preview of the widget below the options. Once it looks the way you want it, click on the Get Code button below the widget. In a new tab, go to Twitter's Publish page. You will see a preview of your timeline, You can click on "set customization options" if you want to change how it looks. 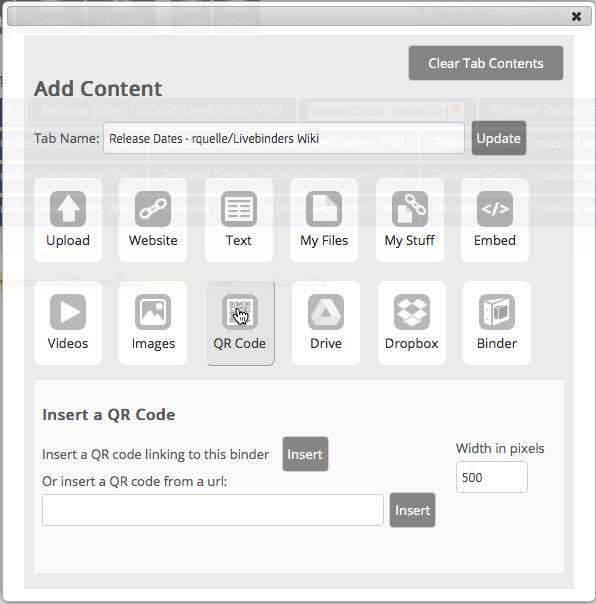 You can embed a QR code for the current binder or for another site. This is often convenient when you are giving a presentation and want to give your audience a link on the projector. 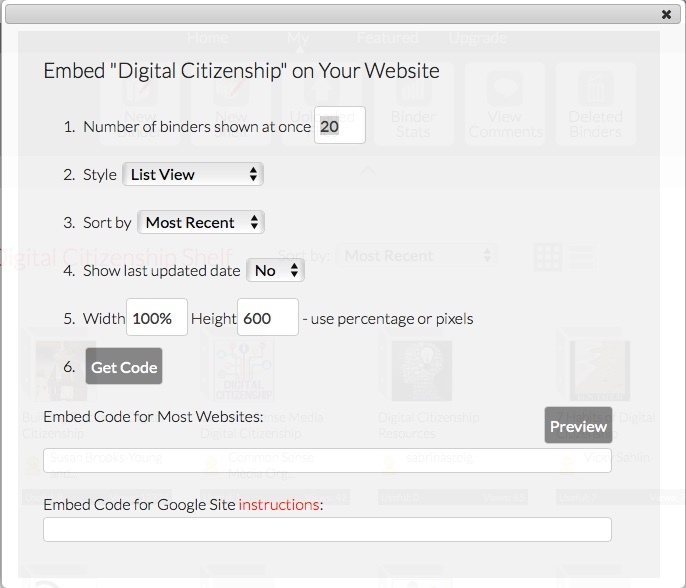 Many multimedia products offer embed codes so that you can embed them right in your binder. Examples include YouTube, Prezi, and Slideshare. To use embed codes from these products, first find the embed code on their site and copy it. You should see your image in the text. You can continue to use the same temporary tab for other images and then just delete it when you are done. Click on "Set Text Layout"
Click on a template that includes text. Highlight the text and click on the link icon at the top of the text box. Shelves are also a great way to collect binders and you can insert a shelf in a binder from the same menu. LiveBinders can automatically display a title page with your binder title, cover, and description as the first or second page. 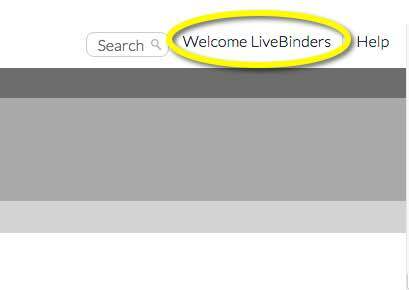 You can also have LiveBinders automatically insert a table of contents that will be updated automatically as you change things in your binder. Just go into your binder in Edit mode and click on Binder Settings > Layout and then select the tab where you would like to see your title page or table of contents. LiveBinders provides links to other binders, comments, and counts inside the binder where other viewers of the binder can see them. You may not want these options on your binder and if you are a subscriber, you can remove all of these options. 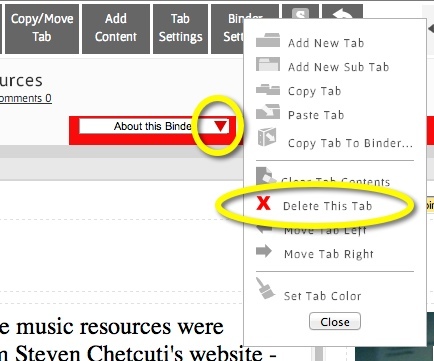 To remove these items, just go into your binder in Edit mode and click on Binder Settings > Layout and then click on the checkboxes of the items you would like to remove from the view of your binder. 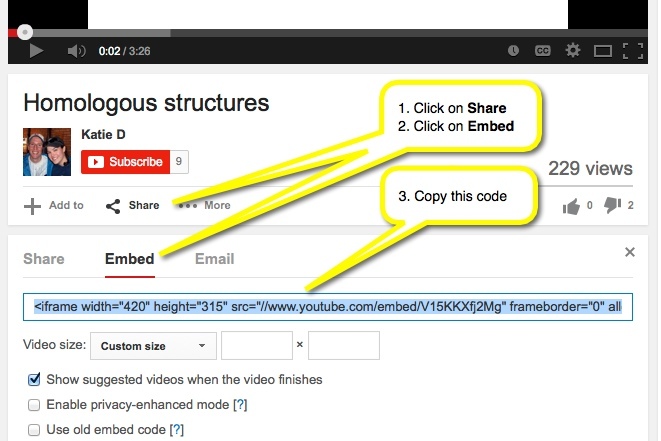 When you upload content or add a webpage, LiveBinders shows a link to that content so that someone can click on that link and view the content outside of the binder. If you don't want to have these links in your binder and you are a subscriber, you can remove them. Note that your selection will be for all links in the binder. 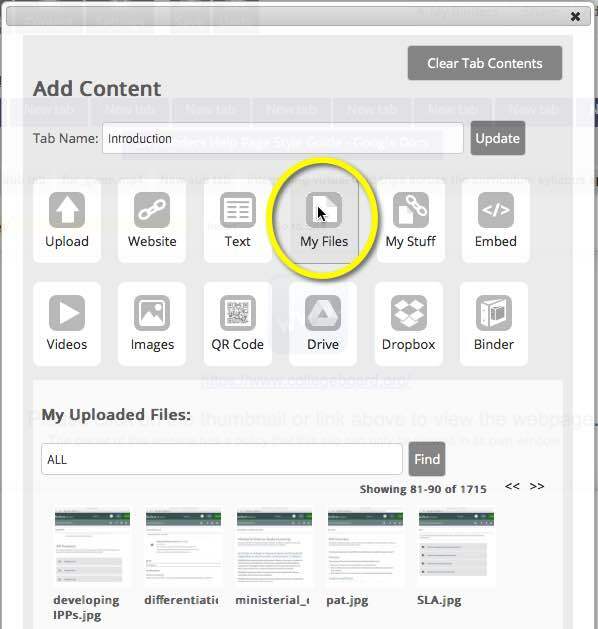 Note that mobile devices need the capability to open content outside the binder, so if you select 2 or 3 the icon will show on mobile devices. 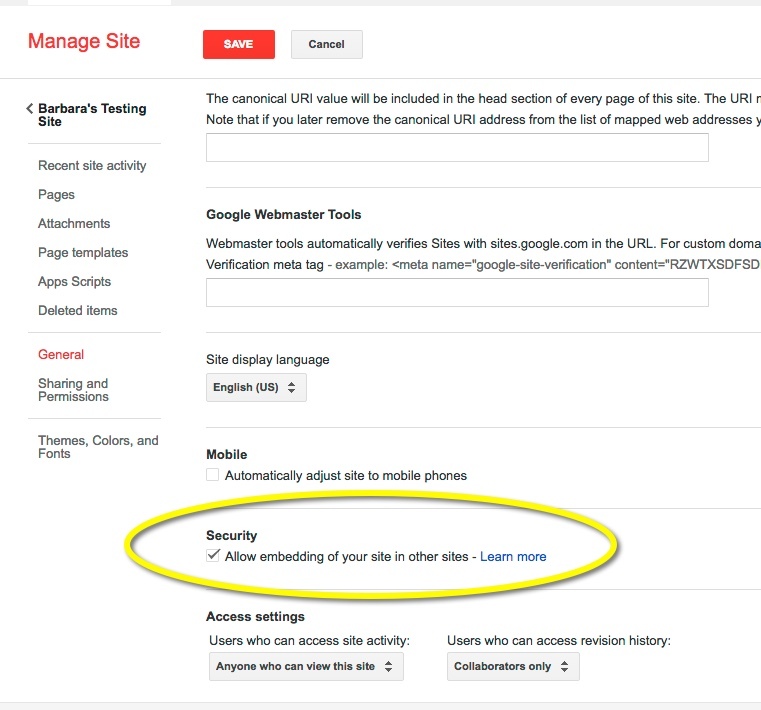 Your Google Site can now be added to your binder with the link. 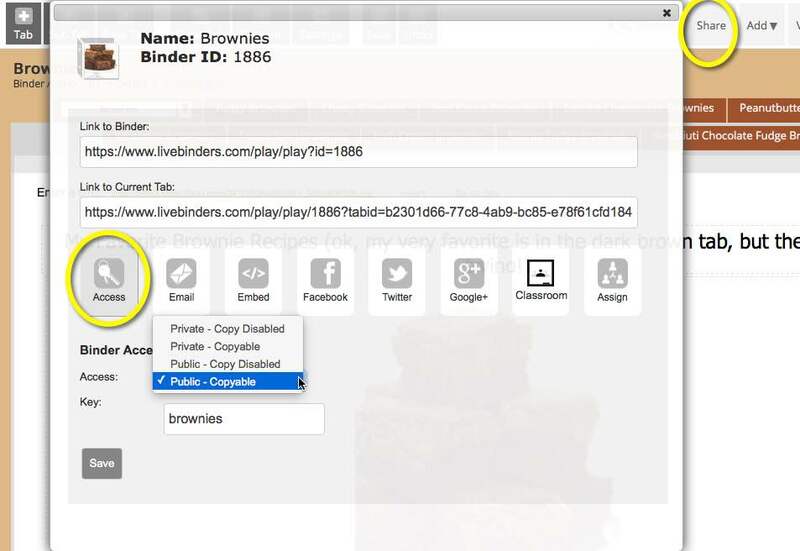 You can find out the date a binder was created, view the description, and see how many people have viewed the binder by selecting Details from the Options menu located next to the name of the binder. 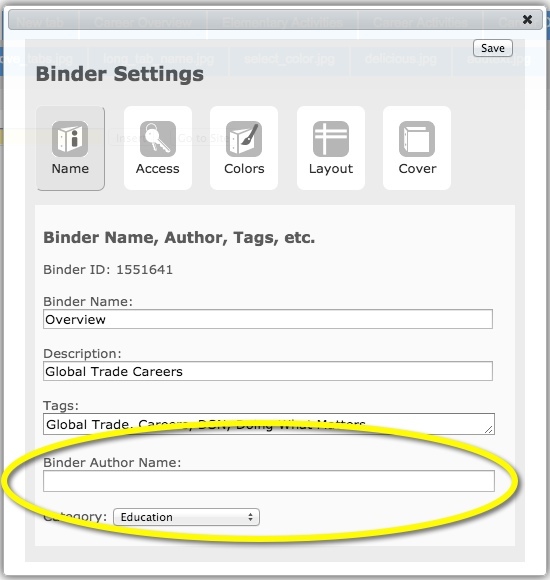 If you are inside binder, you can find out more information about the binder by clicking on the Options button then clicking on Table of Contents then clicking on Details link. This detail page will have information about when the binder was created, when it was last edited, and all tabs in the binder and their links. 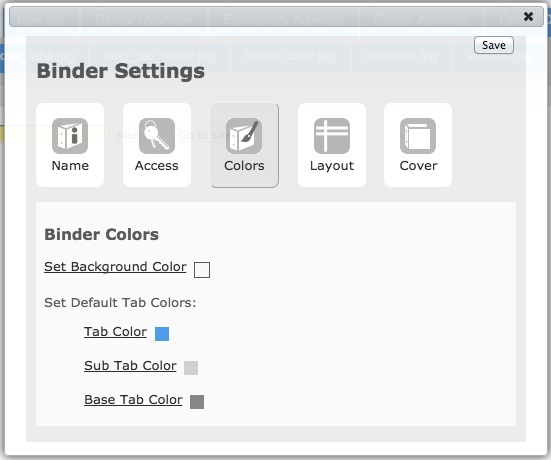 You can change a binder's background color and default tab color from the Binder Settings menu under Colors. To change individual tab colors, use the red arrow pull-down menu next to the active tab. Your username will show up by default as "Binder Author" inside the binder and on the shelf. You may want a different name displayed if you are collaborating with others on a binder or if you want to use your real name instead of your username. Your new name will now appear as the binder author. You may want people to view your binder with tabs on the side instead of on the top or, if you have many tabs, you may want to have viewers of your binder use the tab slider instead of the stacked tabs. 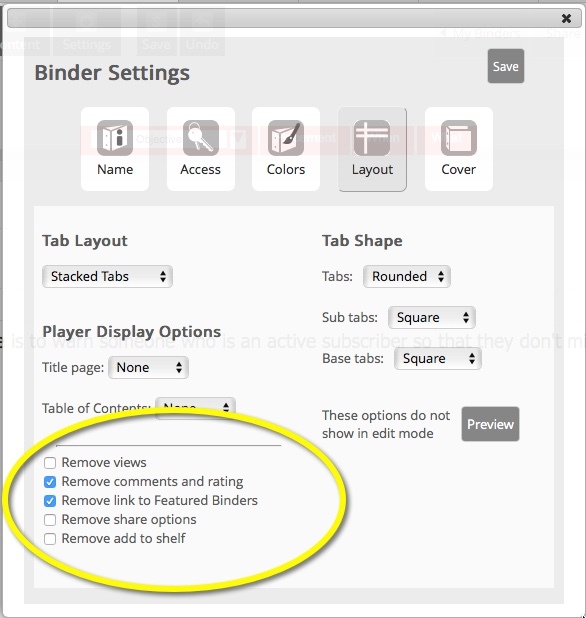 To select how your binder will be viewed, go to Binder Settings > Layout and use the drop-down labeled Default Tab View. 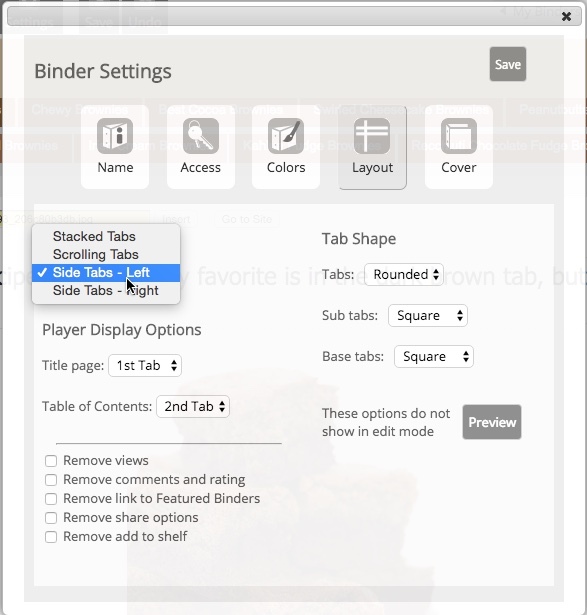 Please note that the editor only shows the stacked tab view, but viewers of your binder will see your binder with the layout that you selected. You can email a single private binder by emailing the binder link to one or more addresses. Anyone who wants to see the binder will need an access key. The access key can be a mixture of letters and numbers, no special characters. The access key is case sensitive. You can type in multiple access keys (if you would like different access keys for different people) by separating them with a comma. 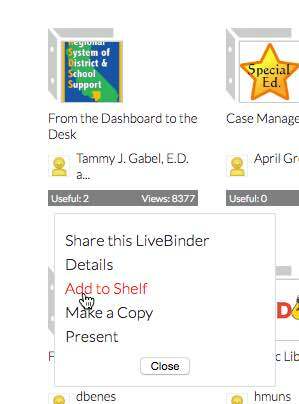 If the person that you are sharing the binder with has a LiveBinders login, you can share a private binder with them and it will appear on their shelf and they won't have to use an access key. 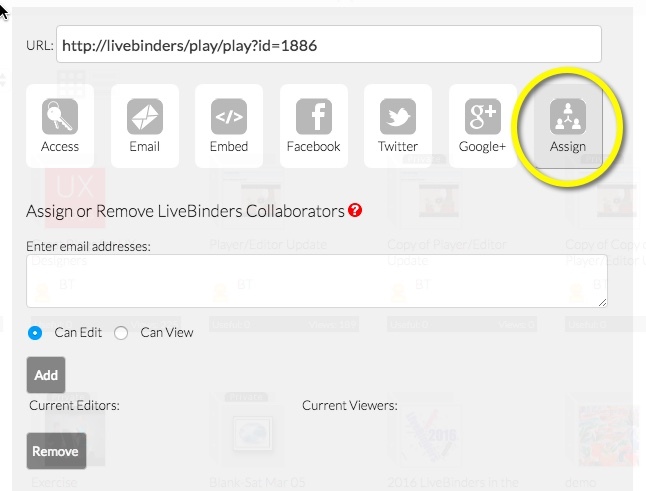 You can also collaborate with people and allow them to edit your binder as long as they all have LiveBinders accounts. 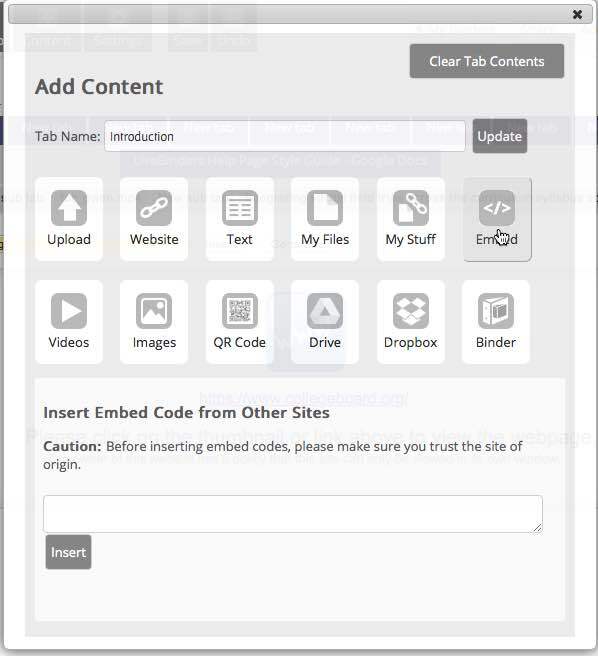 They will be able to add and delete tabs and sub tabs, change text/tab names, and edit the binder in every way except for the binder settings and access - only the author can change the binder settings and access. 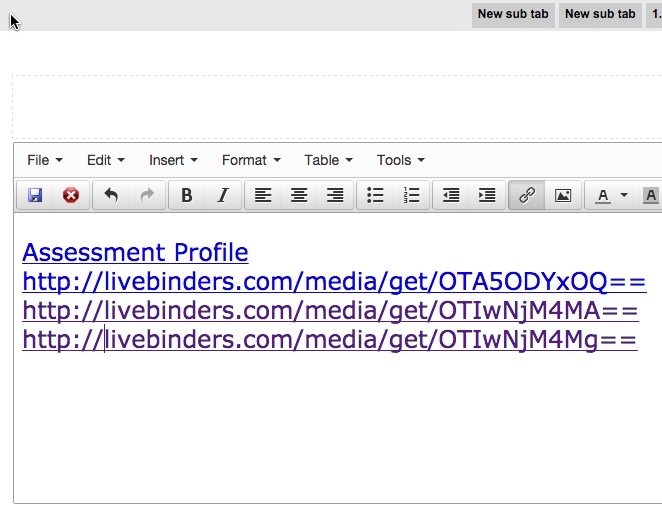 You can share your binder with another LiveBinders user from the shelf or inside the editor. From the shelf, click on Options from the mouseover select Share then Assign. You must know the email addresses of the people you would like to invite to view or edit your binder. These need to be the email addresses that they used to sign up at LiveBinders. Type in those email addresses, with commas separating them, then click on Add. If you have students who used their teacher's email to sign up for LiveBinders, then the other students will need to use a combination of the teacher's email and the student's username to add them as a collaborator. 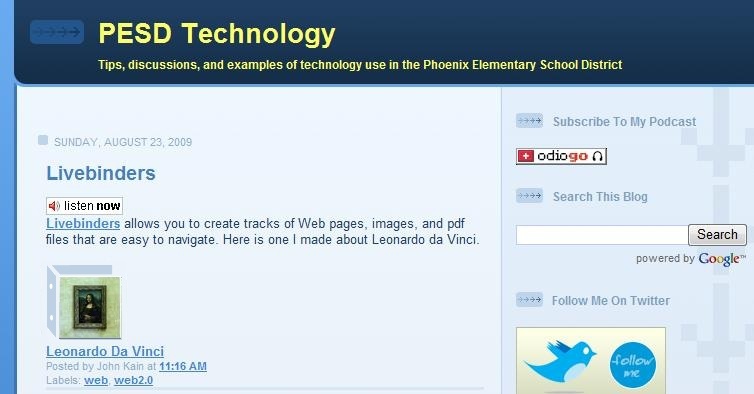 For example, if the teacher's email is teacher@domain.com, than the student's email (for sharing purposes) will be teacher+studentusername@domain.com. You can then send an optional email to everyone to let them know that you are inviting them to collaborate. 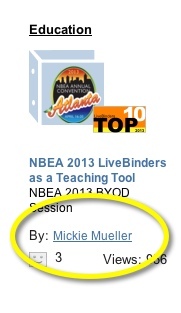 Screenshot of a LiveBinder icon embedded in a blog post. You can copy a binder by selecting Copy from the Options menu underneath the binder on the shelf. 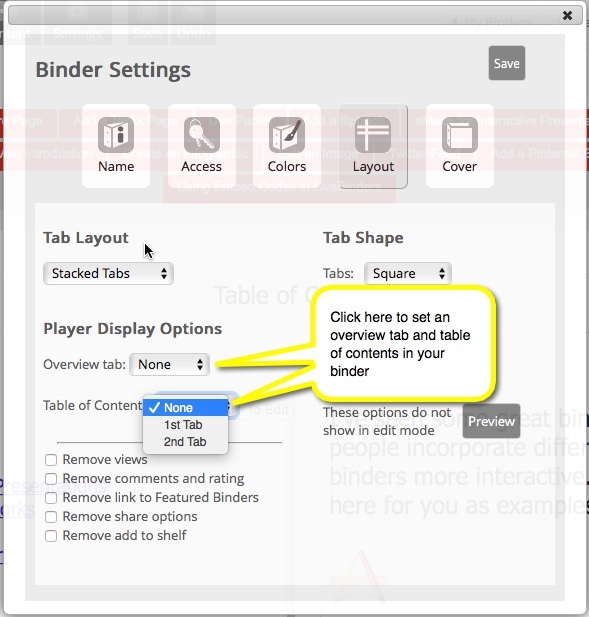 If you are inside a binder you can click on the Options button then click on Copy. The new copy will be added to your My shelf. Mouse over your user name and select My Binders to see the copy. Note: the Copy link will not show up if the author of the binder has decided that they don't want their binder copied. The present feature lets you show a binder without any of the distractions of the top bar. To do this from within a binder by click on Options > Layout > Present. LiveBinders created with a free account are not spidered by search engines. If you would like your binders to be available to search engines, you can either subscribe to LiveBinders or fill out this form. Please see our search engine optimization page for more information on how to make your binders search engine friendly. In addition to your account shelves, you can also create a shelf to organize your binders with other people's binders. These customized shelves can be private or public. 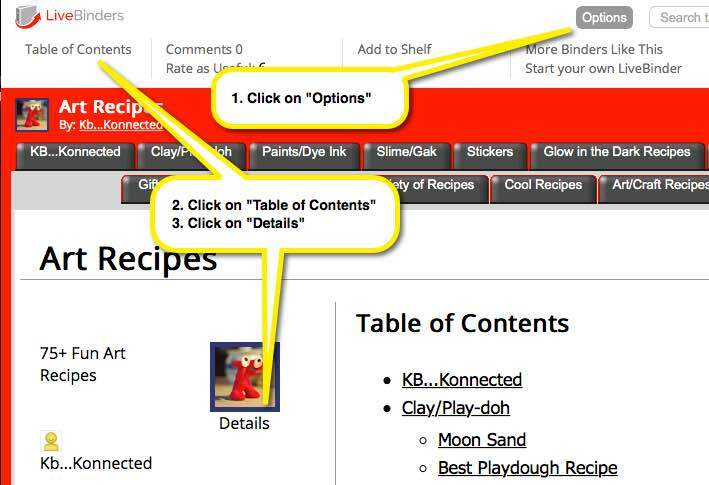 From the My page click on the New Shelf icon in the dashboard above your binders. From within a binder on the top line, click on Options > Add to Shelf. From the Options menu located below any binder icon on a shelf, click on Add to Shelf to add that binder to a new shelf. Give your shelf a name, description, and tags. This will help you and other people find your shelves within LiveBinders. If your shelf is public, people can also search for it from Google. Then determine if you want your shelf to be public or private. If you want to share a private binder, you must create an access key. Like a private binder, only those with the access key will be able to view your private shelf. You can add anyone's public or private binder to your private or public custom shelves. However, if an author has chosen to restrict this access, you will not be able to add that binder to your shelf. From the featured page or another shelf, mouse over the binder to see the Options menu and click on Add to Shelf. You will be given the option to add it to a pre-existing shelf or to add it to a new blank shelf. From within the binder you are viewing, click on the Options menu in the top bar of the binder. Click on Add to Shelf. If "Add to Shelf" is missing - the owner has disabled the ability to add their binder to a shelf. 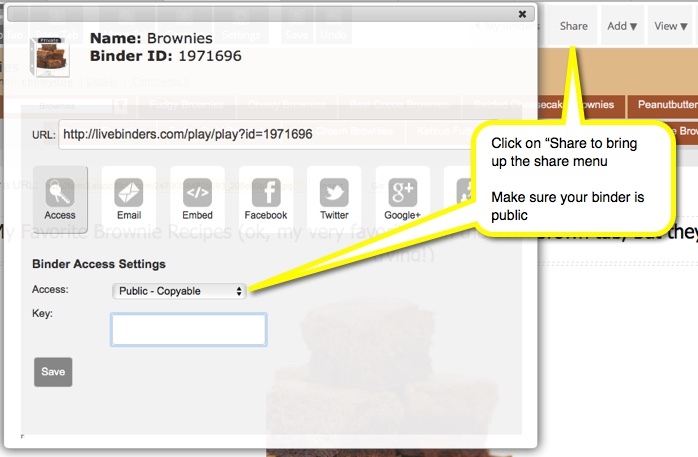 You can contact the owner to request access or you can copy and paste the binder link to a tab in one of your binders. You can also bookmark the binder in your browsers' Favorites folder. 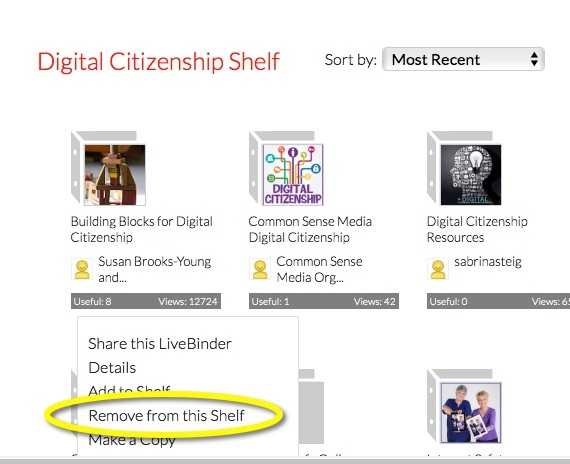 From your shelf, mouse over the binder to see the Options menu and click on Remove from this Shelf. The page will refresh and remove your binder. On your My page, all of your binders are organized on "shelves." There are currently two kinds of shelves in your account: those that can't be shared and those that can be shared. Private account shelves can't be shared: "All my binders," "All my private binders," and "Assigned binders." Your public shelf and any shelf you create are shareable: "All my public binders," and any shelf you create with the "Add to Shelf" link or "Start a blank shelf" link. 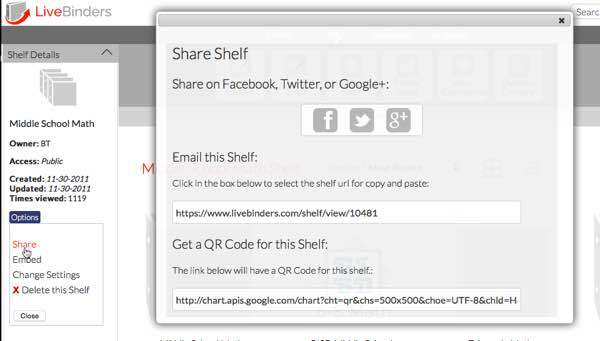 Like a binder, a shelf has a URL that you can share. To share your private customized shelves, you will need to create and provide an access key for your shelf. 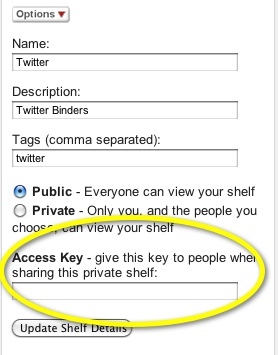 Like your private binders, this will allow anyone with the access key and the link to view your private shelf. To share your private customized shelf, click on the Share and Embed link from the Options drop down menu located under Shelf Details. Copy the link and email both the link and the access key to the person with whom you would like to share your binder. First find the shelf you want to embed by clicking on an author name or on one of your shelves. Then click on the Options button in Shelf Details and then the Embed link. The binders will show up in an iframe box, if there are many binders on a shelf you will want multiple shelf pages. Use this number to decide how many binders you would like on a page. Click on Get Code and copy the code in the box to the appropriate place on your website. Embedding a shelf in a Google Site page is a little complex. This video will walk you through the details. To change the name of a shelf, just click on the Options button under Shelf Details and then click on Change Settings to bring up a menu to change your shelf settings. To delete a shelf, just click on the Options button under Shelf Details and then click on Delete this Shelf. 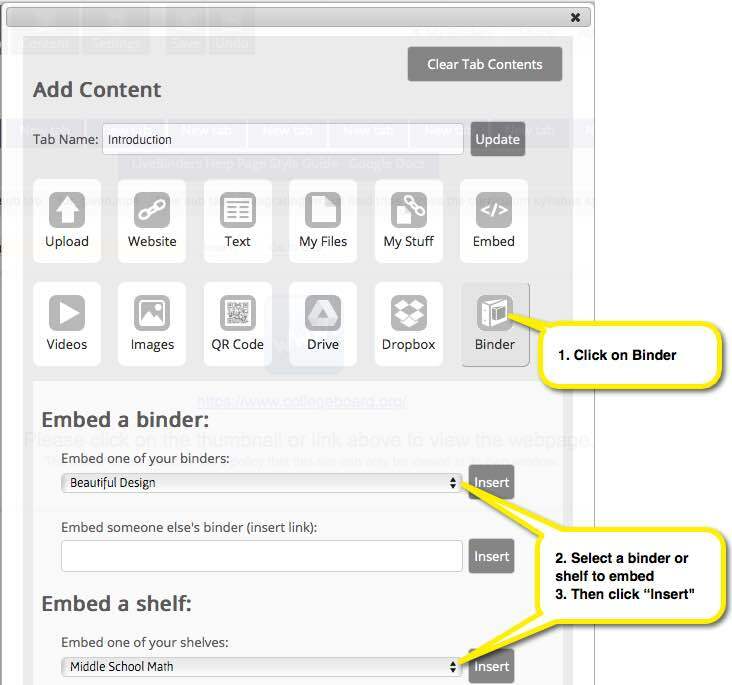 Downloading a binder is a Pro and Pro EDU plan feature that lets you create an offline version (not editable) of your binder. If you have uploaded files to your binder and want a back up copy on your desktop, or if you need to present material in areas where they do not have wifi coverage, you can use this offline version of the binder. Your download copy of the binder is provided in a zip file format. Learn more. Go to the extracted folder and click on the .html file with the name of your binder. 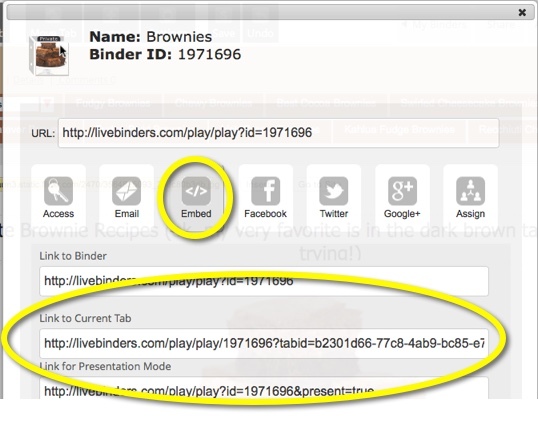 This will launch the downloaded version of your binder in your browser in play mode. Note: Once a binder is downloaded, the downloaded copy of your binder can't be edited. If you are playing your binder offline, none of the web links in your binder will work until you have a wifi connection. All of the uploaded files and the binder table of contents and tab search will work as usual. If you have trouble unzipping your file from your file folder, then download WinZip to unzip your file. NOTE: A very long file name that has been uploaded to your binder may cause problems with certain unzip applications. Try using WinZip to unzip your binder or try uploading a version of the file with a shorter file name. You need to be logged into LiveBinders to add comments. Type your comment and click on "Submit"
The viewers of your binder can search tab names by using the search bar at the top. They do not need to have a LiveBinders account to search for tab names. Word Doc or PDF file: If the text document is a MS Word document or PDF file, you can use the MS Word or PDF application to print the document - those documents in their application will automatically appear either in your binder or as downloads on your computer. Look for the "print" icon from the MS Word or from the PDF menu. 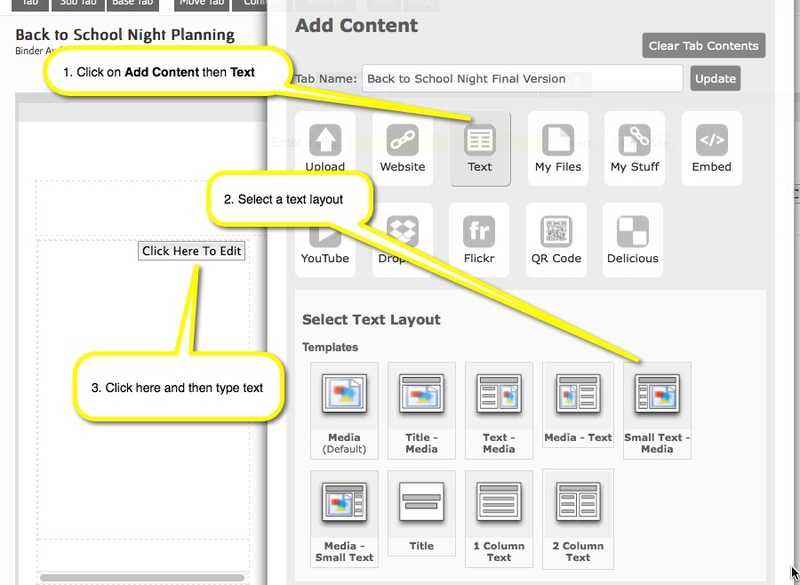 This is the easiest way to print text and is another reason to upload files into the binder. Chrome and IE: Right click on the text and select Print from the drop-down menu. Safari: Right click on the text and select Print Frame from the drop-down menu. Firefox: Right click on the text and select This Frame then Print Frame from the drop-down menu. It isn't the number of tabs that can make a binder too large, but more often something in the text frames causing the problem. If you copy/paste an image into a text frame, this will cause the binder to be too large, or if you copy/paste text from Microsoft Word. If you are seeing a problem with slow auto-saves, please contact support immediately and provide a link to your binder. Your binder will be deleted, but will be saved for 30 days in case you want to undelete it. Your deleted binders are saved for 30 days and are accessible from the deleted binders page. Your binder will appear back on your My shelf. Please note that the access will be "Private - Copy Disabled". You may need to make your binder public again, if that is what you wanted. 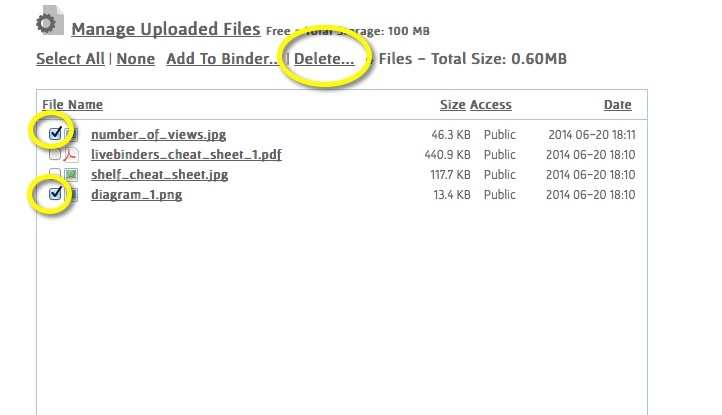 Deleting uploaded files in a binder does not delete them from your account. Click on the Delete link above the files. Those files will be removed and you will regain the space that they were using in your account.